If you are interested in volunteering or observing in our Field Operations Day on Saturday, May 4th, please complete our community registration form. If you have questions regarding this event, please contact Jennifer Ladd at laddj@bartonccc.edu. If you would like to order a Field Ops T-Shirt, you can complete your order at our D's Duds webstore. The program is also designed to meet not only the required continuing education requirements but also a variety of offerings intended to keep you current in the areas of patient care, equipment, techniques, and technology. The program is structured around the current National Standard curriculum and is nationally recognized. 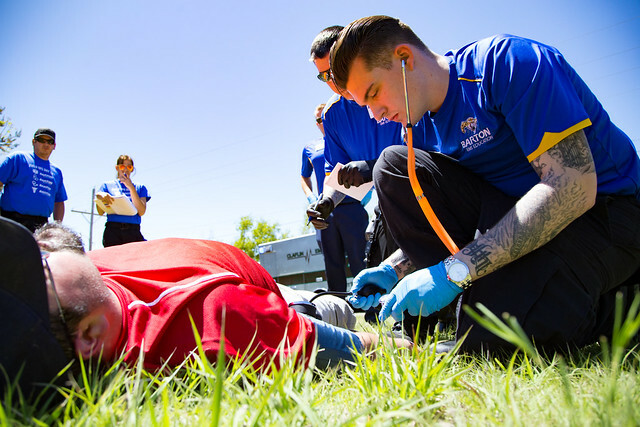 We offer EMT classes each spring and fall semester at both our Great Bend & Grandview Plaza campus. No pre-requisites are required. Student must be 17 years or older to test for certification and have no felonies on record. Enrollment opens up on April 10th for fall 2019 classes. See our fall 2019 EMT flyer for more information or contact Ashlie Thomas at (620) 792-9341 or thomasa@bartonccc.edu. Are you a high school student interested in taking this course? The Kansas Senate passed Excel in CTE Initiative (SB155) in May 2012. This bill authorizes the state of Kansas to pay tuition charges for high school students taking specific tiered Career Technical Courses. Therefore, courses designated as Excel in CTE Initiative (SB155) will be available to high school students at no cost except textbook and program fees, as applicable. See our spring 2019 High School EMT flyer or for more information or contact Ashlie Thomas at (620) 792-9341 or thomasa@bartonccc.edu. We offer AEMT classes at both our Great Bend & Grandview Plaza campus. Student must be a certified Kansas Emergency Medical Technician (EMT), with no additional pre-requisites required. Student must be 17 years or older to test for certification and have no felonies on record. Enrollment for fall classes will open up on April 10th. See our fall 2019 AEMT flyer for more information or contact Ashlie Thomas at (620) 792-9341 or thomasa@bartonccc.edu. See our updated Paramedic cost & Paramedic application requirements needed prior to applying. Each applicant will need to contact Ashlie Thomas to obtain the Phase I document for instructions on how to get started on your application. For questions, more information or to get started on your application, please contact Ashlie Thomas at (620) 792-9341 or thomasa@bartonccc.edu. Student must be a certified Kansas Emergency Medical Technician (EMT) or Advanced Emergency Medical Technician (AEMT). Must complete all general education requirements prior to the first day of the program. Student must be 17 years or older to test for certification and have no felonies on record. Must complete and pass Paramedic entrance application and interview process. Barton offers an IC course each fall semester with an application and interview process. Must be certified Kansas Emergency Medical Technician (EMT) or higher. For requirements, enrollment or more information, contact Ashlie Thomas at (620) 792-9341 or thomasa@bartonccc.edu. Barton has agreements with four year colleges that specifically direct your studies in certain programs for seamless transition from Barton to the transfer school. If you plan to attend Barton and then transfer to a four-year school, please consult with your advisor regarding classes to take at Barton to help you in a smooth transition to your four-year transfer school. Students should also contact the college/university to where they are transferring concerning degree requirements within the appropriate department or college. If you are a Barton EMS student or faculty member that would like to purchase EMS apparel, please visit our online store, D's Duds, to place your order.